U.S. Ambassador to Russia Michael McFaul said he was stepping down following the completion of the Sochi Olympics. "This is my last blog as the U.S. Ambassador to the Russian Federation. Soon after the Olympics, I plan to rejoin my family in California. After more than five years working in the Obama administration, it is time to go home," McFaul posted in his blog on Tuesday. McFaul's wife and two sons moved back to California last summer, the ambassador said. "When we left Stanford for Washington in January 2009, so that I could accept a job at the White House, I told my oldest son that we would be gone only for two years. (Two years is the normal amount of time that professors go on leave to work in the government. )," McFaul said. 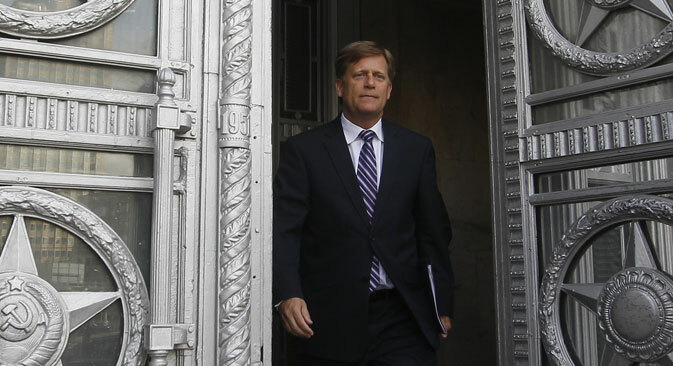 After five years spent away, first in Washington and then Moscow, McFaul's son wanted to return to the U.S. in order to finish high school there, the ambassador wrote. "We all agreed that it was in his best interest to return, and that decision turned out to be the right one. We tried to make a 9,000 kilometer commute work for our family. But after seven months of separation, I simply need to be with my family again," McFaul posted. "Anyone who has followed my blogs over the last two years knows how deeply I value my time with my wife and sons. It's time for us to be reunited," the ambassador said. At the same time, McFail said he would leave Russia reluctantly. "I love this job. It is a tremendous honor to represent my country here. I will miss interacting with my partners in the Russian government and with Russians from all sectors of society and business. And I will deeply miss being a member of a fantastic team at the U.S. Embassy," he said. The departure will mark the end of over five-year work for President Barack Obama's administration, or seven years if to count the work as an unpaid advisor on Obama's campaign, McFaul said.